Some families have less than 20 years between generations. Others like mine it is closer to 30. It looks like my son won’t be ready to settle down until at least 30, so the tradition is continuing. I am only telling you this so you don’t think I am older than I am. My grandmother was born in 1899. She liked being one year older than the year which helps me remember the year of her birth. Well, she saved some of her baby clothes. They are not that spectacular but have some interesting details. They were starched flat as a piece of paper and very brown with age. Well, I washed them and they are now ready to be stored for another hundred years or so in preservation tissue. They are actually in better shape than I thought. Only one is badly ripped. Today I will share a pair of little button on bloomers. 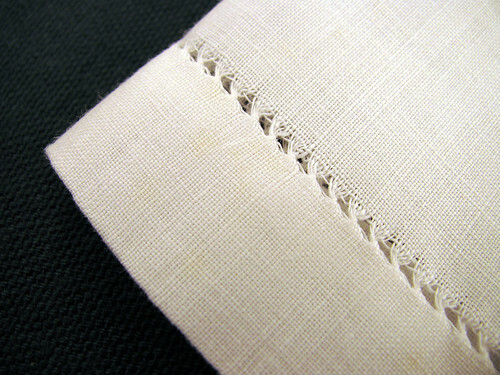 I think the cut is interesting and date them as much as the hemstitched edging. 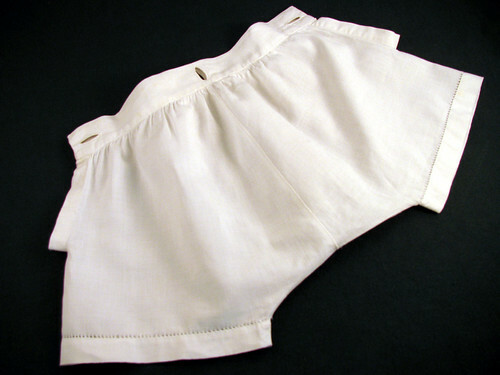 I can’t imagine many of us today would take the time to hemstitch a hem, let alone for a pair of child’s underwear. Notice how the button holes are oriented. They go in line with the pull placed on them. I still have more lace to share. Some of it needs soaking and blocking. I have 4 little dresses to share in the next few days, then I will be back with more lace and hopefully a project. This entry was posted on Monday, March 23rd, 2009 at 3:00 am and is filed under Sewing and Vintage. Tagged: Crochet, Drawn-thread, Embroidery, Sewing, Vintage. You can feed this entry. You can leave a response, or trackback from your own site. Wow, how lucky you are to have such a family heirloom!